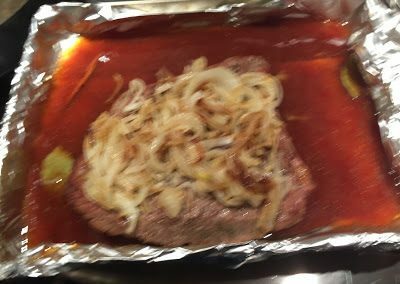 Preheat the oven to 500 degrees F. Using a paring knife, cut small incisions in the meat and shove the pieces of garlic into them. 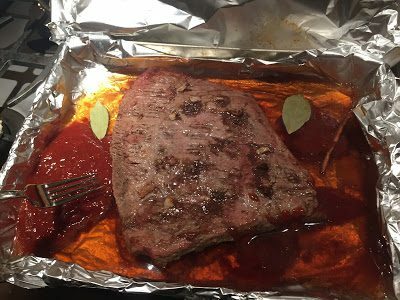 Do this until the meat is stuffed with garlic all over. 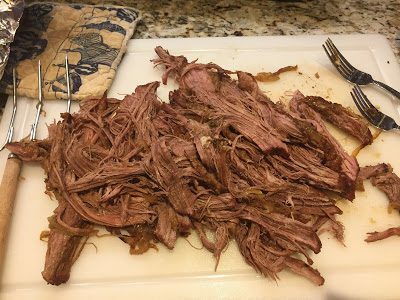 I also cut off a good bit of the fat cap that was on my brisket – personal preference. 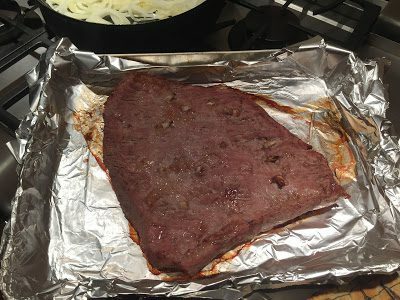 Place the brisket in a rimmed baking dish (preferably metal), and brown it in the oven, about 10 minutes per side. 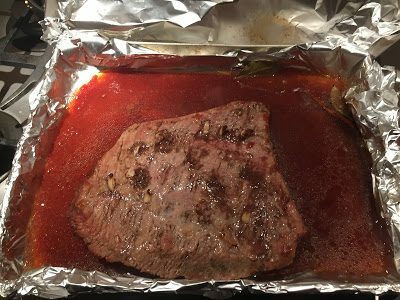 Remove the meat, and pour in the beef stock (NOTE: if you are using a pyrex dish, wait a few minutes for the pan to come to room temperature, so it does not shatter). 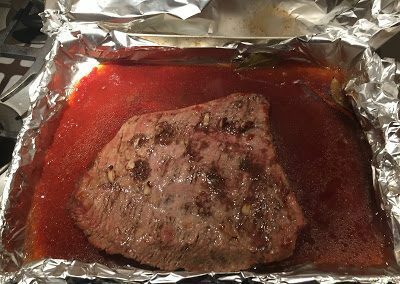 Turn the oven down to 350 degrees F; cover the dish with foil, and cook in the oven for 1 hour. In the meantime, saute the onions in the olive oil over medium-low heat until soft and caramelized, about 25-30 minutes, stirring occasionally. 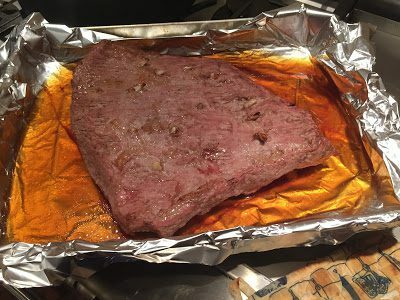 After it has cooked an hour, remove the meat from the oven. 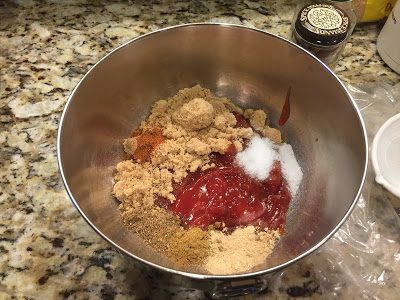 In a small bowl mix together the ketchup, brown sugar, salt, chinese 5 spice, cumin, ginger and cayenne. 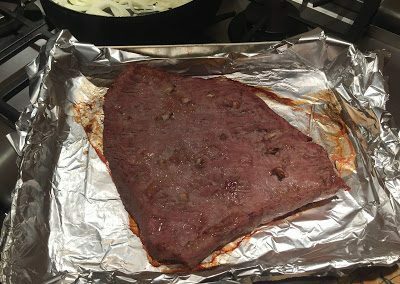 Add that mixture to the pan with the brisket, along with the cinnamon stick and bay leaves. 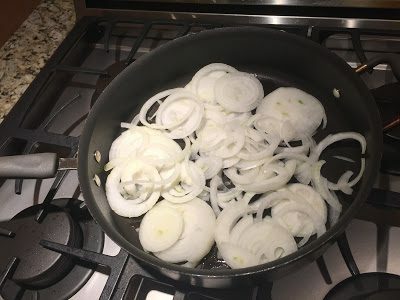 Whisk (using a fork) all together with the beef stock. 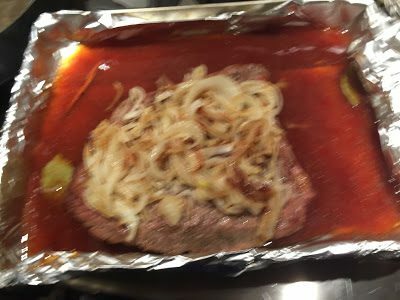 When the onions have finished cooking, arrange them on top of the meat (apologies for the blurry pic). 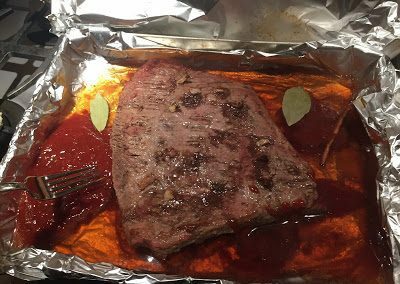 Cover the pan with foil, and return it to the oven for 3 hours. 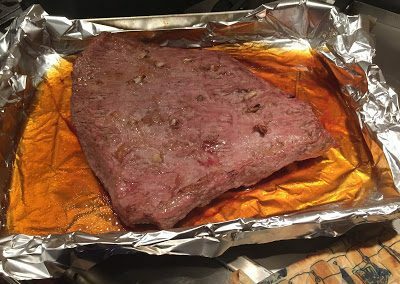 Remove the meat from the oven, allow it to cook slightly, and then transfer to a cutting board. 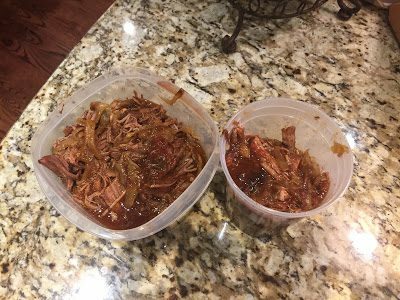 Using 2 forks, pull the brisket apart into chunks. 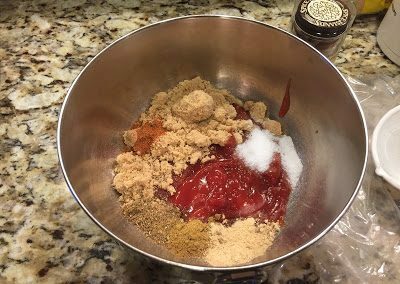 It should be an easy task. You may want to also cut the chunks up into slightly smaller pieces so it’s easier to eat as a sandwich. 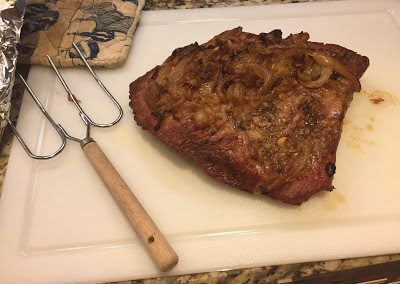 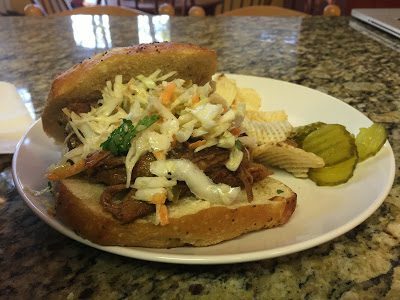 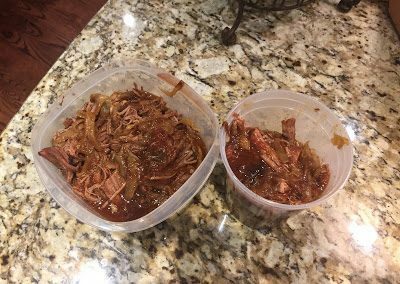 Return the meat to the sauce and serve, or store in the fridge over night in an airtight container – the brisket can be made a day or two in advance. 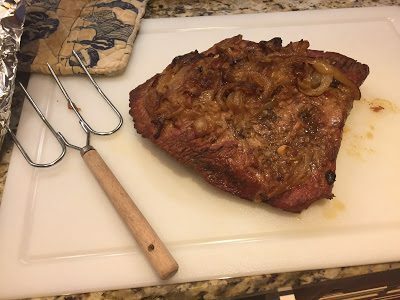 Then reheat on the grill in a tin pan at your tailgate, and serve on rolls. 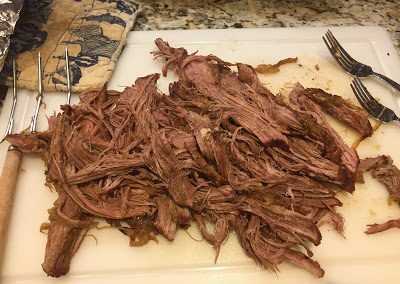 Here is my brisket – all packed up and go to my tailgate party!